DETECTO announces the release of two new wheelchair scale models and upgrades to two existing wheelchair scale models. These high-capacity digital platform scales offer efficient wheelchair patient weighing for hospitals, long-term care, acute care, healthcare clinics, surgery centers, and physical therapy. 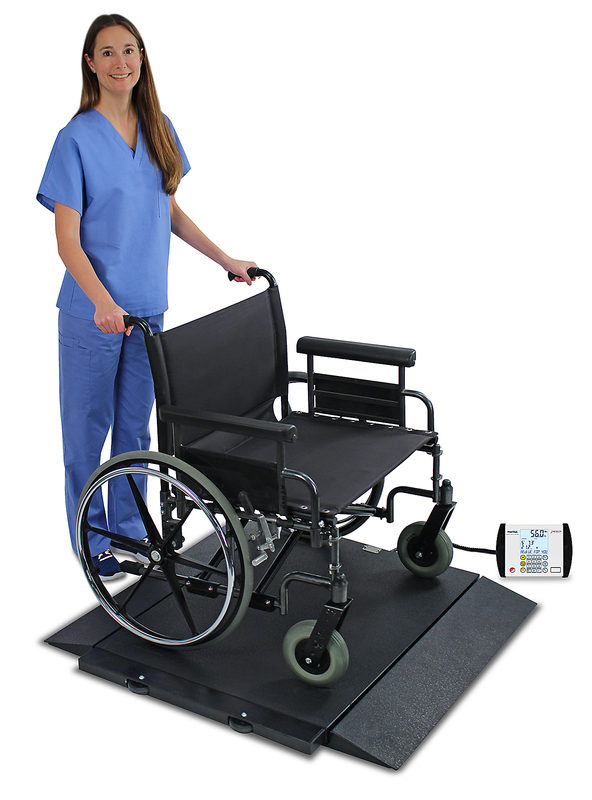 These high-capacity digital platform scales offer efficient wheelchair patient weighing for hospitals, long-term care, acute care, healthcare clinics, surgery centers, and physical therapy. DETECTO's low-profile portable wheelchair scale line offers healthcare professionals four different models to choose from based on whether you need to weigh patients in regular size or bariatric wheelchairs and whether you need basic weighing functions or more complex patient measurement operations. The ramps rest on the floor for easier patient access, so minimal effort is required to roll patients on and off the platform. This ramp improvement requires only half the effort to pull wheelchair patients onto the scale than competitor’s models. The main new feature of DETECTO’s improvement to their wheelchair scale line is the platform that is featured in the new models (6400 and 6600) and upgraded models (6500 and BRW1000). The base of the scale is much thinner (2.2 in/5.6 cm), much wider (36 inches or 40 inches depending on the model), and the ramp inclines run flush to the floor for easier wheelchair accessibility. These crucial enhancements allow for ease of use and less effort when rolling a patient on the scale platform. Out of the improvements made, DETECTO is releasing two new additions to their portable, low-profile wheelchair scale line: the models 6400 and 6600. The model 6400 features a high 1,000-lb/450-kg weight capacity, two guide handles and two integral wheels for easy transport, 14 ft/4.2 coiled cable from the indicator to the scale base, model 750 basic indicator, and 32 in x 36 in / 81 cm x 91 cm weighing platform. The model 6600 features all of the aforementioned benefits, but with a wider base for accommodating bariatric wheelchair patients. The existing models 6500 and BRW1000 come in standard and bariatric wheelchair size platforms, respectively. 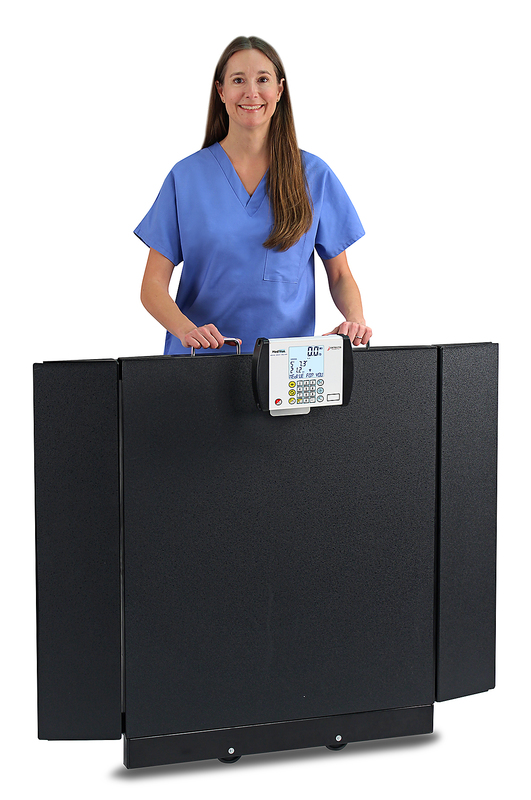 They offer the more advanced MedVue weight indicator that includes backlit blue LCD, RS232 and USB ports, optional Wi-Fi, optional Welch Allyn connectivity for EMR/EHR, and they display weight, height, and BMI onscreen simultaneously.